Hugo also visits the school cafe during breaks because it’s better than hanging around in the school hallways. Hugo’s school – the Riga English Grammar School – even boasts two separate cafes. (Latvian schools normally have a large cafeteria serving whole meals and one or more smaller cafes serving drinks and snacks). Hugo doesn’t usually buy anything else from the school cafes, preferring instead to save the lunch money given to him by his parents – around 14 euros per week meant for whole meals at the cafeteria– to go skateboarding at the former VEF electronics factory. Skipping a hot school lunch in the cafeteria isn’t difficult. “The food is tasteless. It’s pretty dull,” explains Hugo. In his class of 24 pupils, probably fewer than two will have a proper meal for lunch. If he gets really hungry, Hugo will go to the cafe to buy his favourite Snickers chocolate bar. 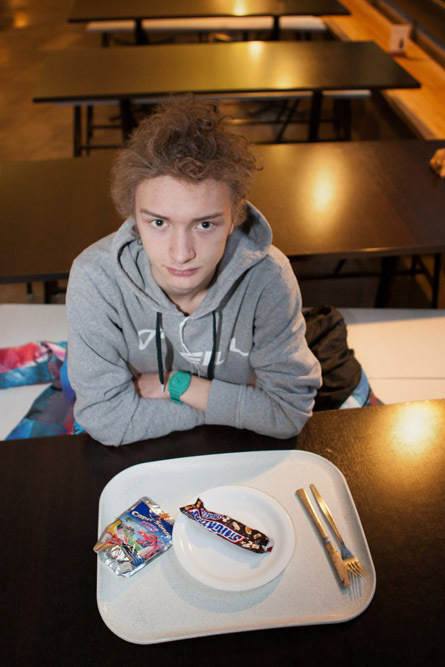 There are many students like Hugo in Latvia who don’t eat a hot meal in the middle of the day. 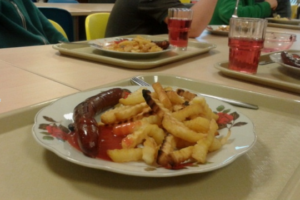 The people responsible for food policy in schools explain that “the picture varies, but it seems that eating in school cafeterias is not seen as cool,” according to Santa Līviņa of the Ministry of Health. Precisely how many of Latvia’s 200,000 schoolchildren skip lunch, no-one knows. It has never been studied. On the other hand, plenty of studies have shown that poor diet and a lack of physical activity among Latvian children are causing them to get fatter. It means that more than half of them will be overweight by the time they become adults. They will get ill more often and not live as long. The greatest threat will only arrive after 20 years or so in the form of heart (cardiovascular) disease, which is the biggest killer in both Latvia and Europe. Last year, half of the premature deaths recorded in Latvia were attributed to heart disease. Compared to the European average, Latvians are three times more likely to die prematurely (before the age of 65) of cardiovascular disease. One means of tackling the problem is to control what the potential victims – schoolchildren – can eat. According to the Ministry of Health and the catering businesses operating within schools, everything is fine. But according to information collected by Re:Baltica over the course of a three month investigation, that is not the case. Analysis of the data shows that half of Latvia’s 936 schools have a cafe, and in them children can readily buy snacks which should not be there. Hugo knows that eating potato chips, Snickers bars and drinking fizzy sodas isn’t healthy – but he doesn’t know exactly why. Nothing is taught in schools about the subject. “Potato chips contain E numbers? Pastries puff out your belly,” he says. Hugo is partly right. Though the inclusion of some E-numbered additives among ingredients of potato chips is one issue, the greater problem is the presence of salt and the palm oil in which they are fried. Human beings require no more than five grammes of salt per day – one teaspoonful. One small 75g pack of chips contains 1.5g of salt, equivalent to a fifth of the full daily amount. Europeans on average eat twice as much salt as they need. The result is high blood pressure, leading to strokes, heart attacks and kidney disease. As part of a 10-year-long targeted salt reduction campaign in the United Kingdom, salt intake was reduced by 10% in four years, which is estimated to have saved 6,000 lives per year. Hugo doesn’t bother with chips too much, perhaps because it’s been easy to avoid them as for the last seven years, it has not been possible to buy potato chips in Latvian schools. The same for Coca-Cola. In 2003 the government banned the sale in schools of products with certain ingredients, for example candy bars and bubble gums containing artificial sweeteners and colouring agents. In order to ban potato chips, in 2006 the government determined a maximum level of salt that products could contain – a level that is exceeded by packets of chips. In a similar manner, schools were “liberated” from Coca-Cola, Fanta and Sprite when it was established that carbonated drinks could not contain caffeine and colouring agents. The introduction of these regulations in 2006 caused a storm of protest, including an indignant letter to then-President Vaira Vike-Freiberga from former US Secretary of State Madeleine Albright on behalf of the Coca-Cola business empire. International food and drink companies were alarmed that Latvia’s school regulations could set a precedent for the EU. Similar bans on unhealthy food in schools had been introduced only in Denmark and the United Kingdom. Meanwhile local producers criticised the economic impact the regulation of school food would have, recalls Ilze Straume of the Ministry of Health. However, the march of trans-fats and sugars, which are just as damaging as salt and E-numbers, through school cafeterias and cafes has continued unabated since 2006. 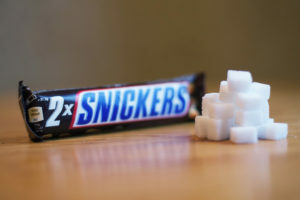 In Hugo’s favourite 75 g Snickers bar there are almost ten teaspoons of sugar. In a breakfast pastry there are on average six teaspoons. Therefore with just these two snacks, Hugo has consumed more that the daily norm of 60 grams or fifteen teaspoons. The World Heath Organization maintains that even 60g of sugar is too much and that an adult should consume half as much – 30g. Sugar is called the white poison because in excessive amounts it not only damages teeth but also causes obesity, which in turn leads to heart and blood vessel ailments. Recently children and teenagers have begun to suffer from type 2 diabetes, until now a disease associated with the middle-aged. 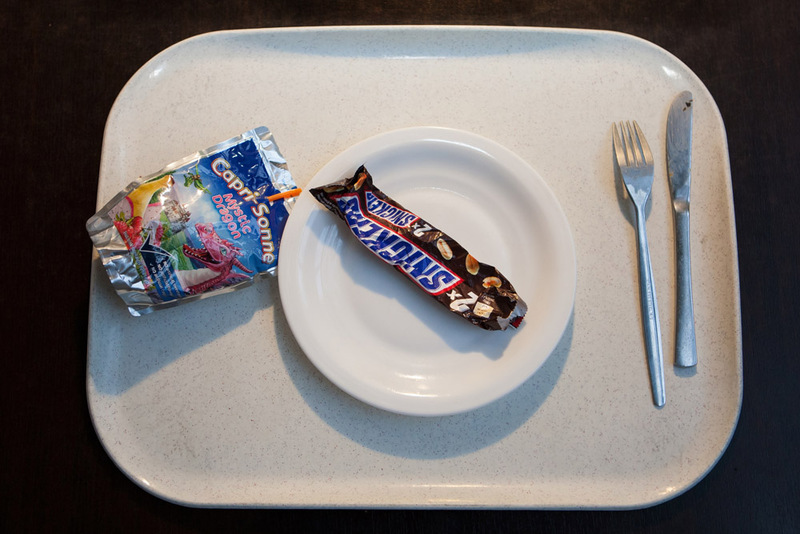 But for Hugo, Snickers is cheaper than a warm lunch and gives him the feeling of being sated. These grams of sugar contain many calories and give a rush of energy. But this rush soon ends as sugar does not contain any other important nutrients, and so soon he wants to eat again. According to Re:Baltica observations, Snickers along with Twix, Mars, Bounty and Lion are the most frequently found chocolates in Latvian schools. The amount of sugar in each is similar. It is also misleading to think that one can buy only healthy drinks in Latvian schools after the banning of Coca-Cola. A Nestle Peach half litre of ice tea, sold in many schools, contains eight teaspoons of sugar, and a Kapri juice drink contains five teaspoons of sugar. Rasēns milk drink contains 2.5 teaspoons of added sugar, though the actual sugar content is double this amount, the rest being naturally occurring sugars in the milk itself, according to the manufacturer, Rīgas Piena Kombināts. The famous British TV chef Jamie Oliver, a well-known advocate of healthy eating in schools, has said: “Flavoured milk has no place in schools.” He classes it alongside carbonated soft drinks and sugar-added juices. According to the Latvian Centre for Disease Prevention, flavoured milk was available to buy in 30% of first-grade state schools, an increase of 13% over 5 years. Hugo says he would happily buy mandarins from the school cafe, but they rarely make an appearance. If he is lucky he may be handed an apple or carrot, as his school participates in an EU-funded programme providing free fruit and vegetables to 9th-grade students. One of Hugo’s classmates generally brings the class allowance of fruit and vegetables from the cafeteria in a bag, and those that want take something. Since 2008, more and more school cafeterias have offered fresh fruit, vegetables, milk, sugar-free drinks and water. But at the same time the unhealthy snacks on offer have increased too. The number of sweets and candies has increased by 14% and sweet hot drinks by 20% as a result of vending machines being installed. One third of schools have access to hot drinks vending machines. Exactly what students buy and whether these foods and drinks are healthy or not has not been the subject of research. Hugo’s parents gave him his first skateboard when he was four years old, but he has been skating seriously for about six years now, taking part in competitions and aiming to win prizes. “It’s pretty normal for me,” says Hugo. While practising his tricks on the skateboard he likes to listen to 80s rock legends Black Sabbath or rappers NWA on his headphones. Between training sessions he heads to a nearby Prisma store to buy salad, tuna, juice and Snickers. 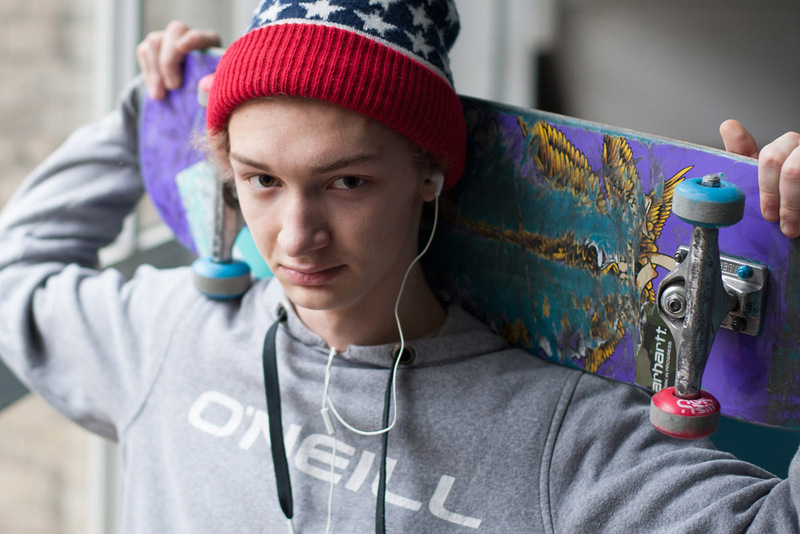 In the winter, Hugo uses his free time to travel from his home in Pardaugava to the VEF skate park on the other side of Riga. He comes home from school at around 3pm on school days. He eats a late lunch prepared by his mother, who is at home looking after his younger brother. After that he spends a few hours playing computer games, does his homework and if there’s time, watches a film. On schooldays he is less physically active than at the weekend. Physical education lessons take place just twice a week. In Latvia only one in five teenagers is classed as taking physical exercise for at least one hour per day, another reason for the increasing prevalence of obesity. Between 2006 and 2010 the proportion of overweight boys in Hugo’s age group increased by 13%, with similar trends recorded in Estonia and Lithuania. “Ten years ago, this was a problem among just a few percent of Latvian teenagers,” says Iveta Pudule, spokeswoman for the Disease Prevention and Control Centre which is working with the WHO to track teenage health trends in Latvia. “The reason for this is lack of physical activity and poor diet,” she says. Hugo is by no means fat – he is thin. But one day three years ago he had such bad stomach pains that he was taken to hospital by the emergency medical services. Gastritis was diagnosed and he had to return to hospital several times. “The pain was awful,” Hugo says. Now he tries to avoid fried foods and white flour. However, his mother admits she does occasionally find empty potato chip packets in his bedroom. Around 14% of boys Hugo’s age and 25% of girls complain of stomach pain at least once per month. Although it seems Hugo need not worry about being overweight, he does face another menace in his school cafe that could cause long-term health problems in the form of palm oil and hydrogenated fats. 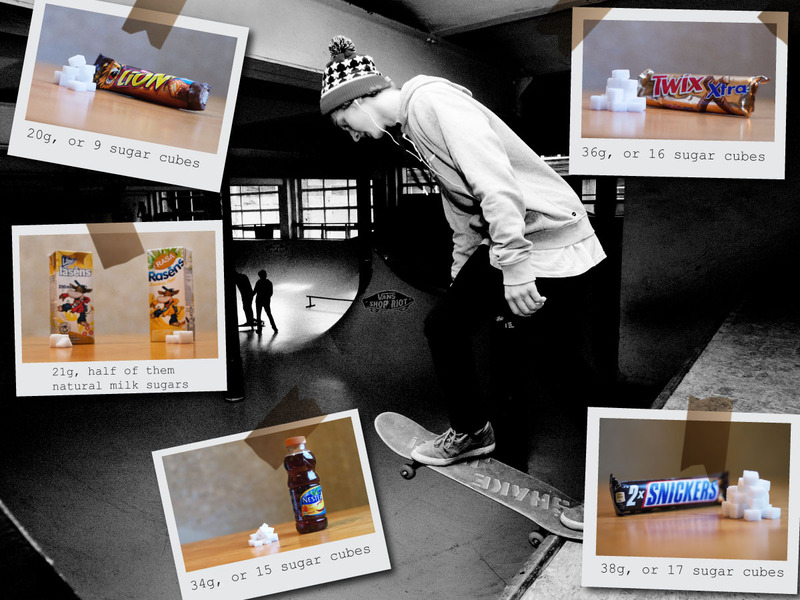 Palm oil is an ingredient of Hugo’s favourite Snickers bar. This oil is high in calories but has little nutritional value. Palm oil raises cholesterol levels and over a period of years causes vascular occlusion or “clogging of the arteries”. It is a similar story with trans-fats. They are chemically concentrated, cheap and have a long shelf life, so are used as an ingredient in many food products. Experts recommend that fats should not exceed 30% of daily food intake. Of these, up to 10% may be so-called “bad fats” or trans-fatty acids such as hydrogenated vegetable fats. Famous for its fight against “bad fats” is Finland, which began an active campaign to reduce the amount of fat and salt in the Finnish diet as early as the 1960s. At the time, Finland recorded the highest mortality rates in the world from cardiovascular diseases. In the following decades, the number of deaths from these disease decreased by 80% and the average life expectancy increased by 10 years. The Danes have taken things a step further by limiting the level of “bad fats” or trans-fatty acids in food products to no more than 2%. Limits have also been introduced in Austria, Switzerland and the Netherlands. In the latter case it is estimated that the annual number of deaths from heart disease decreased by 10% as a result. In Latvia it is permitted to sell products that contain trans-fats without even specifying the exact level. Experts interviewed by Re:Baltica said they believe it necessary to complete measures introduced in schools ten years ago which prohibited the use of certain ingredients. For example, school cooks may not use hydrogenated fats and flavour enhancers in preparing warm meals, but these ingredients are allowed in products sold in school cafes (e.g. chocolate and cookies). A striking example is the unhealthy flavour enhancer E621; Re:Baltica found Pērnes potato strips and Patella chips, both containing E621, for sale in Latvian schools. For its part, the Disease Prevention and Control Centre concludes in one piece of research: “The school environment does not provide opportunities to develop healthy eating and physical activity habits, because poor quality foodstuffs (snacks) can be purchased in schools”. The responsibility for the kinds of snacks Hugo and other pupils can buy during their school breaks lies with the schools and the firms operating the cafeterias. The people working in school cafes have to check if their products are harmful to children. But in practice this is not always easy to do as manufacturers are not compelled to specify the exact composition of their products. For example, the sugar content of the widely-available Tymbark sugared juice drink is not specified at all. Potato chip packets stating they contain the catch-all “vegetable oil” can in reality contain palm oil or hydrogenated fats. At six schools in Riga, Re:Baltica found a wide range of candies, jellies and chocolates offered, as well as potato strips, a popular local form of potato chips. “If one product is prohibited, manufacturers simply adapt and create some sort of similar product. In principle this is a situation where the letter of the law rather than the spirit of the law is observed,” concludes Iveta Pudule of the Disease Prevention and Control Centre. Limiting the unhealthy snacks sold in schools can already be done. But it seems a vain hope to believe companies will put the health of pupils before their own profit margins. The database of the Food and Veterinary Office shows that half of the 936 schools in Latvia have their cafeterias run by private companies, with the remainder employing their own cooks. Schools or local authorities announce a tender for the provision of school meals . For most of these catering companies, running school cafes represents an important additional source of income. Analysis of the data conducted by Re:Baltica, EazyBi and Lursoft shows that in 23 Latvian municipalities, school catering is provided exclusively by private firms. Most of these municipalities are in the Valmiera region. Last October the firms Kantīne B and Salvis won a tender for provision of catering in all schools and nursing homes in a contract worth 5.5 million euros. At the other extreme, in Rēzekne in all 12 school canteens are operated by the municipality; only two school shops are in private hands. In Valmiera, the set lunchtime meal in schools costs 1.20 euros, while in Rēzekne it is 1 euro, though the municipality also pays the cooks’ wages and kitchen costs. Of the approximately 250 firms working in Latvian schools, eleven operate in six schools or more. The market leader over the last few years is the Lithuanian company Kretingos Maisto, which has won contracts so that it currently operates in 25 Latvian schools, mostly in small municipalities. Data provided by the company’s head office in Lithuania shows that in 2012 it had turnover of 7.5 million euros, of which 0.7 million came from the Latvian market – double the previous year’s contribution. In Sigulda municipality, where Kretingos Maisto won the tender a few years ago, the municipality says it is partly satisfied with the lunches provided. At the Laurenču Primary School food has tended to be over-cooked, but in other schools it tastes good. The price of set meal of the day was the basis on which the catering contract was awarded and is just 0.96 euros. Sigulda council spokeswoman Līga Sausiņa believes that the price of the set meal is very low, but that the firm earns its profits by charging more for other items which the children choose. The low price was achieved by paying workers the minimum wage, not paying holiday pay during the summer holidays and buying in products in bulk. “Where the quality is good, it is achieved by the enthusiasm of the workers,” says Sausiņa. In the capital Riga the leading positions for years have been occupied by the catering firms Žaks–2 (19 schools) and Aniva (12 schools). Fierce competition is expected in 2014 as contracts for 35 schools will be open for bidding. As school meals represent only part of the business done by the market leading companies it is difficult to determine precisely what they earn from their school operations. However, data suggests that their involvement is both profitable and stable. Compared with the average in the catering industry, these firms seem to do better. Tax data shows that in 2012 60% of catering businesses worked at a loss but according to Re:Baltica’s estimates, of the largest school catering firms only around 25% recorded a loss, with the others turning a profit. Perhaps the best evidence that school catering is a valuable business comes from the fierce competition that surrounds it. It’s difficult to find a tender in which the results have not been challenged. For example in a tender in Liepāja, one firm lost the tender because its bid documents were fastened together with a spiral plastic binding rather than bound together with string. In another case, Kretingos Maisto complained that one of the reasons they were rejected in Valmiera was that the inclusion of skin on the chickens they serve was deemed “not a product compatible with the principles of a healthy diet”. No documents were provided showing why chicken skin was unacceptable when the company complained to the Procurement Monitoring Bureau. The business outlook is also reflected in the growing number of cafes in schools. Since 2008 there has been an 8% increase in the number of schools providing additional food services in the form of a cafe or shop . Increased competition has also contributed to a degree of self-regulation within the industry. Three years ago, the Educational Institutions’ Catering Association was set up, which currently represents approximately 30 catering businesses responsible for around 100 schools and kindergartens. Association Head Silvija Miniča says that companies joined together to raise standards and combat companies that were dumping bad food at low prices. “A lunch might consist of soup made with a couple of cabbage leaves and barley, three cookies and and a juice, all for 90 euro cents,” remembers Miniča. In 2012 new regulations for school’s cafeterias meal came into force which were developed in conjunction with the Ministry of Health. They stated that meat products (as opposed to real meat ) could be included on menus no more than once a week, if they contained less than 70% meat (similarly 60% for fish products). At a stroke that put an end to the majority of frankfurters, sausages, bacon dumplings and many other kids’ favourites. Cooking in oil was prohibited, which meant a farewell to french fries. Salt and sugar levels were restricted. Ilona Dreimane of the Association of Food Technologists, says that the amount of salt may even have been reduced too drastically. “Children in rural areas, where the family was used to eating salt, refused to eat the food at all,” says Dreimane. In December last year, the government allowed an increase in the amount of salt, despite opposition by the medical profession. In general terms, the government has tried to control what children can eat at school in cafeterias. But Re:Baltica has observed that schools are using creative approaches to get around the rules. At Riga No. 49 Middle School, mayonnaise (which is classed as an additive) was mixed with dill and cucumbers and renamed a “cold sauce”. Equally, in December it was still possible to buy french fries with ketchup at Sigulda State Gymnasium. Both are prohibited. PVD inspections show that many school cafeterias break the rules and breach the fundamental principles of a healthy diet. In the first half of 2013 a total of 2,223 discrepancies were recorded, around 30% them concerning E621. These violations were detected “by eye” as the PVD lacks necessary funding to carry out proper laboratory tests. In Latvia there is not a single laboratory capable of determining if, for example, meatballs consist of mechanically recovered meat. Regulations specify that meat can only be ground on the spot in schools. The PVD is largely limited to requesting documents confirming the origin of the meat. Some caterers find such an approach frustrating and a waste of time, suggesting the PVD is more concerned with paperwork than actually examining what is served up on the plate each day. Of all the violations recorded, 12% related to the sale of non-recommended products to children. Overall, however, businessmen and representatives of the Ministry of Health agree good oversight is provided of hot meals in school cafeterias. The question is, what to do with the cafes? It wasn’t always the case that Hugo skipped lunch at school. Until the 7th grade he attended the Riga Dome Choir School and ate in the cafeteria there. The food was good. He’s been at the Riga English Grammar School for three years, during which time “I’ve eaten here about five times,” he notes. To Hugo, the food is not only “dull” but expensive. A small bowl of salad costs 0.64 euros, a side portion such as potatoes or buckwheat another 0.56 euros and a cutlet about 0.85 euros. A normal lunch can easily cost 2.84 euros – a figure which seems to be too high for children. Nutritionists and others interviewed by Re:Baltica repeatedly said that in providing a tasty lunch the main key to success is the cook, and it doesn’t matter whether they are employed by the school itself or a private firm. The main customers of the school cafes are older students. There is no data on how many children live on cafe snacks, but school cooks observe that after the 5th grade students eat what they choose in the cafeteria (rather than eat the set meal) or snack in the cafe. “In discussions with young people they revealed that they might like to eat a hot lunch, but if it’s judged to be uncool in their class, they will buy more snacks,” says Santa Līviņa from the Ministry of Health. This cult of ‘cool’ food is fuelled by advertising. TNS data shows that the most-advertised food and beverage brands during the first ten months of 2013 were dominated by confectionery: Milka, Danone, Grany, Ingman. Among drinks, Jacobs, Gutta, Coca- Cola and water Mangaļi dominated. The food groups most advertised in Latvia are ice cream, cookies, chewing gum and chocolates. A University of Amsterdam study shows that there is a significant correlation between children’s choices and the amount of advertising they are subjected to – the more children watch television, the more they choose unhealthy products. Latvian Disease Prevention and Control Centre data shows that across the country, schools are carrying advertising for food and drink with a low nutritional value. In 2010, such advertising was present in 14% of rural schools, but two years later the figure rose to almost 35%. Advertisements featuring unhealthy products were in 46% of Riga first-grade schools in 2012, despite the fact that the law prohibits food advertising in schools. The Ministry of Health’s Līviņa believes that restricting the product range or closing school cafes would not help. Children would simply go to the nearest shop instead. The root of the problem is that families fail to teach children how to eat healthily. According to Miniča, cafes are not the major source of revenue for firms. Depending on the region, they can represent 20-30 percent of the company’s turnover. Miniča’s own company Fristar catering is in the top ten and works in Riga, Jelgava and Carnikavā. Fristar in 2012 had a turnover of nearly 1 million euros. If schools cafes were banned, Fristar would stand to lose 200,000 euros. Currently, each school itself decides how much to teach about healthy eating. At Riga English Grammar School, the principles of healthy eating are discussed in home economics and general study classes. But it is not enough according to nutrition specialist Lizete Māldere, who believes several other things could be done. Lunch menus should be devised by modern nutritionists, not cooks on minimum wage, the ingredients of cafe products should be brought under control and help should be sought from nutrition specialists as, according to Māldere, teachers themselves often do not understand what constitutes healthy food. Hugo doesn’t remember if he has ever had a lesson on healthy eating. He thinks about a proper diet but doesn’t worry about it. He has a hot meal at home. If he gets too hungry, there’s always a cafe just around the corner from his school.